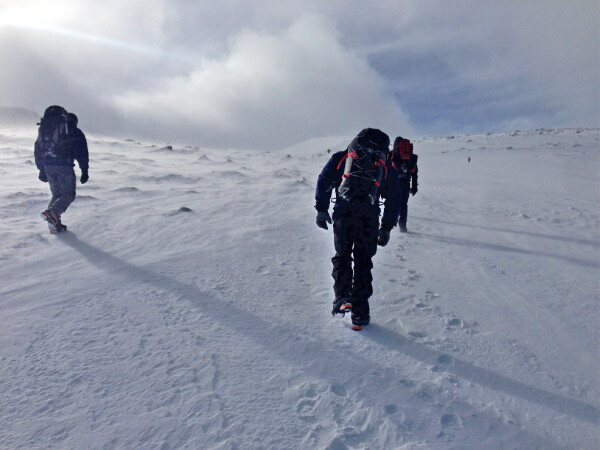 From the 01-07 March 2015 the National Air Cadet Adventure Training Centre Windermere ran Ex Winter Cairngorm – a winter expedition in Scotland for 16 Cadet Force Adult Volunteer Staff. The aim of this expedition was to provide a winter mountain foundation course (WMF), winter climbing foundation (WCF) course and the opportunity to gain further winter mountaineering experience (WME). The group was accommodated at Feshiebridge Lodge near Aviemore where, after an initial briefing, they split down into their teams for the week to discuss plans. The following provides a flavour of the areas visited and training undertaken. Day 1 Consisted of a re-familiarisation to the Scottish winter environment with all groups covering the use of ice axes and crampons. All groups where also introduced to the use of avalanche transceivers and strategies for locating buried casualties quickly. 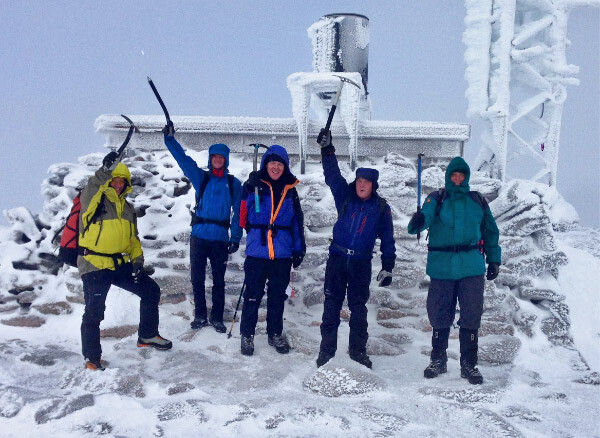 The WME group did this as part of a journey around the northern corries of the Cairngorm massif including the summit of Cairn Lochan. Day 2 The winter Mountain Experience team headed out for a long day over the Sgorrans, an area of mountains on the western edge of the Cairngorm plateau. The day provided great opportunities to practice mountain navigation skills with white out conditions encountered for several hours during the day along with a good test of clothing layering systems in 70mph westerly winds. Day 3 The WMF group, acting on good information from the WME group, decided to head up into the Sgorran area to undertake a 2 day expedition spending the night in a snow hole near the summit of Carn Ban More. After an early start the group continued their traverse of the Sgorran summits on day 4 returning to the lodge mid afternoon to re-warm and sort kit. Day 4 With the weather slowly warming up and winds forecast to 80 mph, the Climbing group took the decision to focus on skills after 3 good climbing days. 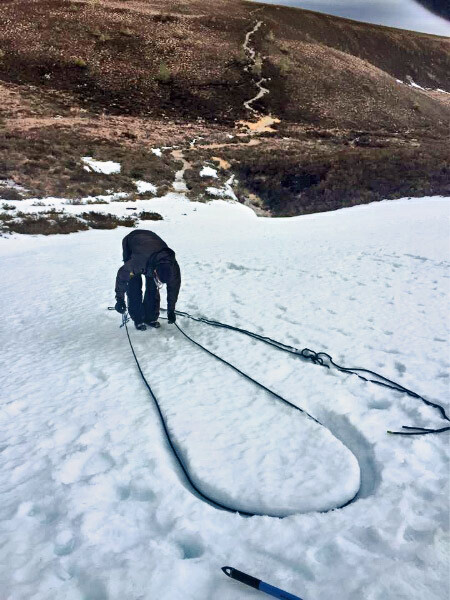 They headed into Coire an-t-Sneachda to look at techniques for building belays in snow and ice. Day 5 A forecast for winds above 100 mph and the freezing level going above the summits, all teams decided to stay low. Most took the opportunity to use the new transceiver park at Glenmore Lodge to look at strategies for managing a team of people locating multiple casualties in a large scale avalanche. The rest of the day was spent looking at basic snow belays in order to extend the candidates already existing summer knowledge of the use of the rope to protect other members of their group on steep ground. The expedition proved successful in introducing Air Cadet Organisation volunteer staff to the techniques required for safe travel in the mountains in winter. It also provided a good opportunity to develop a cohort of staff who already had a personal interest in the winter mountain environment towards the Winter Mountain Leader qualification. We would like to thank the Ulysses Trust and the RAF Charitable Trust for their support with this expedition and the opportunities it provided to develop the knowledge and skills of the ACO staff.